Reproduced from Gault, R., (1994). The Potential of Paperclay. Ceramic: Art and Perception. (18), 81-85 with permission from Rosette Gault and Editor Janet Mansfield. Rosette Gault, Doing the Dishes (Detail) 100 x 75 x 5 cm. AMBITIOUS, EXPERIMENTAL AND DARING SCULPTURAL projects may now be attempted by artists who choose to use the medium of paperclay ceramics. Paper pulp, added as an ingredient to the clay body, burns away early in the firing, leaving a familiar and durable ceramic product virtually unrecognizable from conventional ceramics except that the fired paper ceramic weighs less. How much less depends on how much pulp was added to the original clay recipe. The ability to work multiple layers of wet paper slip, plastic clay and dry paperclay together and to embed or insert fragments of dry, bisqued or glazed clay into the structure and fire it intact, opens up possibilities in ceramic sculpture. As the paperclay greenware is strong, it is easier to transport to the kiln. In addition, the absence of cracks in greenware and bisque is liberating and it is possible to model, carve, mould, sculpt or assemble without having to take as much care in the drying of the work. The micro view of paperclay seen through scanned electron micrographs reveals in detail what was, hitherto, only understood by intuition and experience. We can see now why we can work multiple layers of wet paperclay over dry without cracks appearing between the layers. The micrographs shown here illustrate close views of clay and paperclay before and after firing. In comparison to other additives, paper fibres (pulp or cellulose) are smaller than nylon. sawdust, vermiculite or grog. 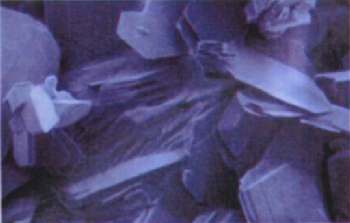 In the micrographs of the paperclay body, a cellulose fibre, shaped like a tapered tube with rough abrasive surface, can be seen. This will embed easily and firmly in a matrix of millions of surrounding drying clay particles. A paper fibre is flexible, compressible and highly absorbent of water. Each fibre can wick water by osmosis from one end of the tube to the other. 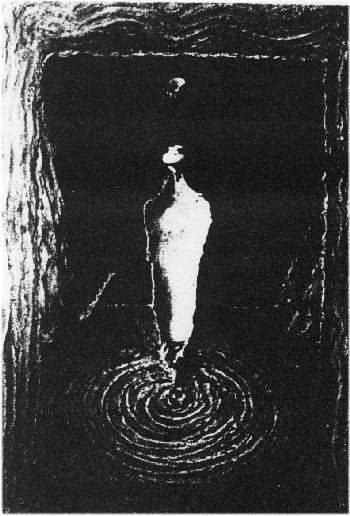 When a layer of wet mix is put directly over bone dry paperclay, the cellulose tubes behave as conduits through which water seeps into the matrix of clay. As the clay shrinks, so also the network of cellulose tubes contracts. When a fresh layer of moisture or wet paperclay slip is added, the water seeps through the existing network of thirsty fibres. Thus both the fibres and the clay expand and/or contract gradually to permit multiple layering. The tiny fibres interrupt and inhibit crack formations in the green clay and this explains, in part, why the greenware is so durable. For these reasons, when making paperclay, it is important to add the wet pulp to liquid slip rather than try to wedge in paper pulp when the clay is already at the plastic stage. The fibres of cellulose found in the pulp must be individually dispersed in a homogeneous way throughout the clay body so that a capillary network of fibre can be established. Ideally, the fibres knit the whole mixture together in a strong lattice-like structure after the firing, provided the ratio of pulp to clay is correct and an accurate maturing temperature of the mixture has been determined. Rosette Gault with work in progress. 1993 Photo: Brian Gartside. Electron micrograph of paperclay sample after bisque firing. Courtesy of David Kingery, University of Arizona. Often the maturing temperature of paperclay bodies has been raised a cone or two because of the clay present in the paper making some high pulp paperclay bodies slightly more refractory. A ceramic sculptor can control the grain of the paperclay by hand. You will notice the predominant direction of the fibres in the micrograph provided by David Kingery. Therefore, several layers placed in opposite directions will strengthen a joint which needs reinforcement. 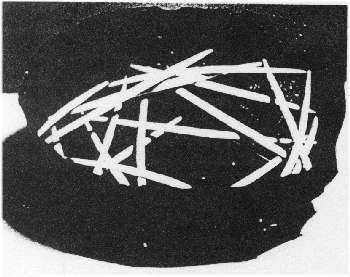 The micrograph of clay particles provided by Professor W. Keller of University of Missouri illustrates the flat clay particles in kaolin. Try to imagine a million kaolin particles in a cubic centimetre surrounding a strand of cellulose fibre. Just as plaster quickly attracts the water particles of a liquid slip turning the clay into a dense mass, so the absorbent cellulose fibres function in a paperclay body. Research continues and further investigation is needed. Many questions are still to be answered: What happens at high temperatures? Do trace minerals from the residual fibre ash glaze the wall of the fibre voids? If cellulose fibres are deliberately presoaked in fluxes or refractory minerals before they are added to the paperclay, what effects will this have on the fired matrix? What exact effect does the fibre size and quantity have on the green and fired paper ceramic stress tolerance? Basic understanding of the processes at the microscopic level is the starting point for clay sculptors who wish to use this material successfully. As artists, our challenge is to cross the threshold to an era of increased sculptural freedom. This involves a fresh frame of reference. Previous technical rules do not apply when new methods are used. With paperclay ceramic, it is possible to realise visions and goals which would be impossible with conventional clay alone. However, it can be a danger, as frequently happens with potters and ceramists, to become so caught up in the medium and the processes that one loses sight of the purpose of art. Anita Rocamura. Gather no Moss (Butterflies). (Detail) Smoked.1.1m x 32.5cm. Gregor Turk. 49th Parallel (Turtle Mountain) 40 cm x 50cm x 2.2m. It seems fitting that evolution is one of Pneumatos’ central themes. This pioneer work addresses the topic of liberation in both a sculptural and graphic manner. Images of bones, wings, plants, animals, rocks, seeds and more, suggest a simultaneous interdependence and an integration of spiritual and material values. In my early work in paperclay, I embedded bisqued and greenware work made of a conventional clay body directly into wet paperclay to construct large paintings which I fired flat, bridged over kiln shelves in a large oval kiln. I appreciated the technical freedom to work on a larger scale without fear of cracks. For example, my work. Doing the Dishes, refers to the entire history, metaphor and process of pottery form as well as the issue of nourishment. In the work Inside Passage, 1 was free to trust my intuition and express ideas succinctly in a enduring but simple visual image. The next series of large scale paperclay paintings Who Lies Here? considers part of my mind as a vessel with self-imposed but false limitations which appear to be fixed in space. With the paperclay medium I was free to carve deeply into the walls and construct steps The texture of wet paperclay is ideal to give the illusion of simultaneously fluid and solid structure. In the work, Future Book, the folly of human impatience, greed and wilfulness is visible in the torn page. Here the rigid fired paperclay freezes an act of violence as if it were stopped in mid sentence; all that now remains is the fossil. The ambitious slab work of Gregor Turk from USA shows his experience, craftsmanship and talent to advantage. In 49th Parallel, tension is visible as the skin-like surface of the earth is arched over a complex sub-structure. In contrast, Van Phrasavath, currently a student at the University of Florida, accomplished his form, Cathedral, using a slab construction. The works of Ibrabim Wagh (England), Alec Sortschynski (Canada) and Jennifer Clarke (Canada), all colleagues at Banff in 1990, indicate a range of Various clay bodies, firing treatments, temperatures and approaches. These are some examples of the wider range of concepts now being seen in the field of artistic ceramics using the medium of paperclay. Rosette Gault. Inside Passage. 100 x 75 x 5 cm. Pots set in paperclay and fired together Rosette Gault. Future Book. 30 x 25 x 2.5 cm. Rosette Gault. Future Book. 30 x 25 x 2.5 cm. Alex Sortschynski, Vessel. 35 cm/diam. Ibrahim Wagh.Untitled. 70 x 50 1 cm. Van Phrasavath. Cathedral. 1 m. x 55 x 30 cm. Rosette Gault.Who Lives Here? 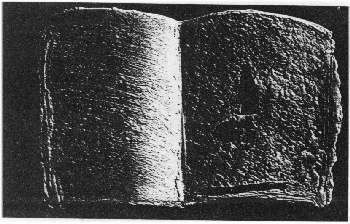 90 x 52.5 x 2.5 cm. Rosette Gault is a ceramic sculptor living in Seattle, Washington. 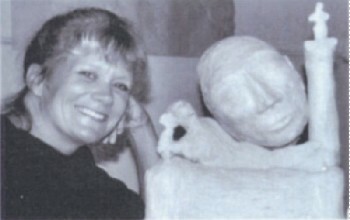 Her article on the methods of using paperclay appeared in the June 1992 issue of Ceramic Monthly. Gault also recommends Brian Gartside’s articles on paperclay published in the New Zealand Potter. Rosette Gault has written a 62-page handbook Paperclay for Ceramic Sculptors, available from PO Box 9060, Seattle WA 98109 USA. A license for commercial or industrial applications of this patent pending process must be obtained from the author.